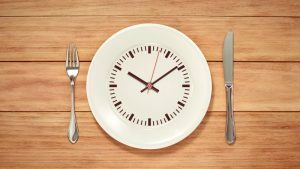 Intermittent fasting has become very popular again but its been around forever. In this article I want to give you and over view so you can get going in this right away. Leptin and insulin sensitivity which reduces the risk of chronic disease from diabetes to heart disease and even cancer. Ghrelin levels also known as the hunger hormone which reduces over eating. Your ability to become fat adapted, which causes your body to burn stored fat for energy. Triglyceride levels which decreases your risk of heart disease. Eat for 8 hours and fast for 16 hours.